So the economy is bad and families are tightening their belts to save here and there. In time like this, we can always use a few helpful tips. If that’s what you are thinking, then you may want to check out a new site called Tip Jar from Google, a place where you can share and take tips. The tips are grouped in several topics, such as Finance, Economy, Health, Tech, Shopping, Kids & Family, Cars & Transit, Food, Vacation, At Home, At Work, and Misc. You can browse each topic to find useful tips supplied by others and if you like the tip, you can vote it to make it popular. 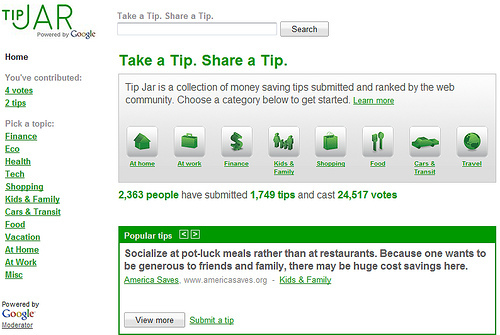 If you have tips that you want to share with others, you can submit them as well. All you need is a Gmail account and a screen name.